I cherish my weekends. I try to savor every minute of the two glorious days where I can shed (most) responsibility & stress and just be. And savoring them over a delicious brunch is pretty much as good as it gets. But Neil and I have made a promise to eat out less and cook at home way more, and that means brunch falls in my hands. For some reason, despite being an amazing cook, Neil’s intimidated by breakfast. His creative ideas cease to flow pre-coffee, and just the thought of having to figure out what to eat seems to push him over the edge. Though I don’t mind because breakfast and brunch is definitely my domain. I love thinking of interesting breakfast creations, brewing up a pot of good coffee, turning on some weekend-appropriate music and getting to work in the kitchen. As much as I love meeting friends for brunch and having someone else cook for me in my down time, taking the time and care to make something beautiful myself and then sitting down with my husband at our own kitchen table to enjoy it, is a bit of weekend bliss. Here’s a quick and delicious brunch that I made yesterday, using what we had in our fridge. 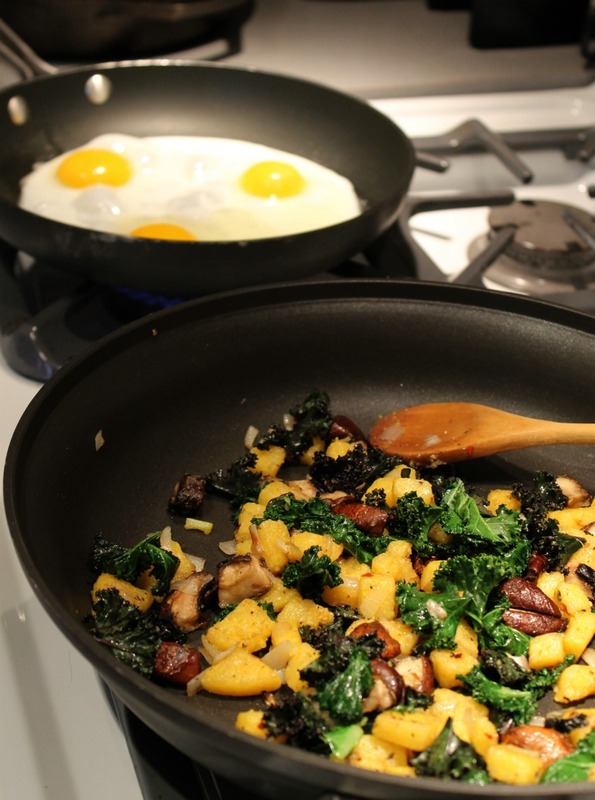 When I spotted the polenta and mushrooms, I imagined an earthy, savory hash to go with eggs. I cooked the eggs medium so that the yolks were still rich and runny but not too thin or liquid-ey when they broke. There’s something so satisfyingly perfect about breaking a rich egg yolk overtop of savory ingredients and taking a bite of everything together. With a cup of dark coffee, I think this brunch stands up to the best of them. Oh, and it took about 12 minutes to throw together. Way less than standing in a brunch lineup! Cut off a few rounds of the polenta (I used three) and then chop them into small cubes. Chop the shallot and mushrooms into small pieces and tear the kale into small bite-sized pieces as well. Heat a bit of olive oil in a pan over medium heat and sauté the shallot for a few minutes, seasoning with a bit of salt. Add in the kale and mushrooms and cook for a few more minutes before adding in the polenta cubes. Sautee everything together, season with pepper and a few chili flakes. I drizzled just a little bit of Nudo’s thyme-infused olive oil into the hash, which added such a great earthy compliment to the mushrooms and kale. You could use some dried or fresh thyme instead, but only use a little bit so as not to overwhelm. Cook on medium-low heat until the polenta cubes are a bit crispy on the outside. Meanwhile, heat another pan and cook a few eggs sunny-side up. I cooked ours to medium so the yolk was still gloopy and runny, but not too liquid-ey. 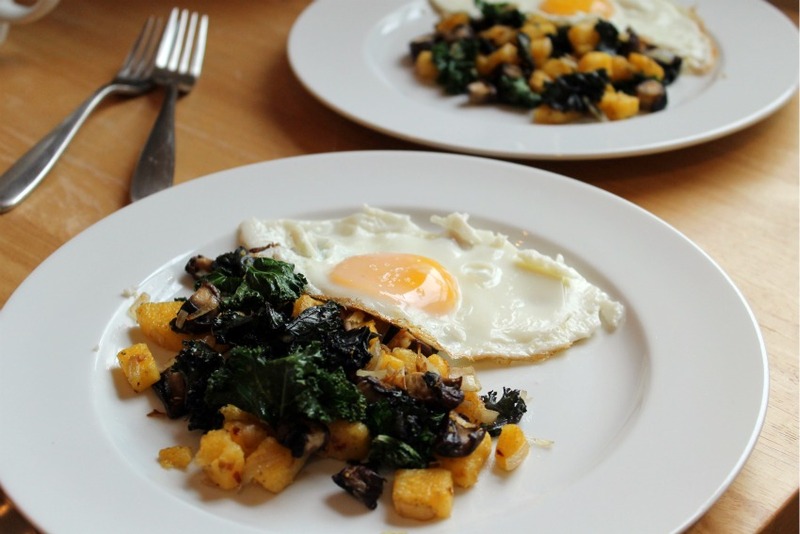 Plate the polenta ‘hash’ and top with eggs. 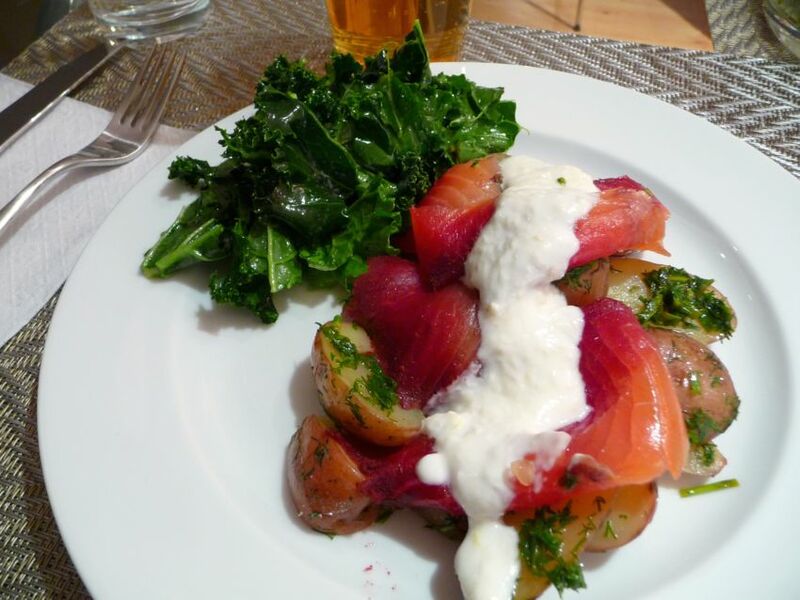 On a recent trip to my hometown of Montreal, my sisters and I were inspired to make a fresh and healthy meal together after traipsing through the Atwater Market. 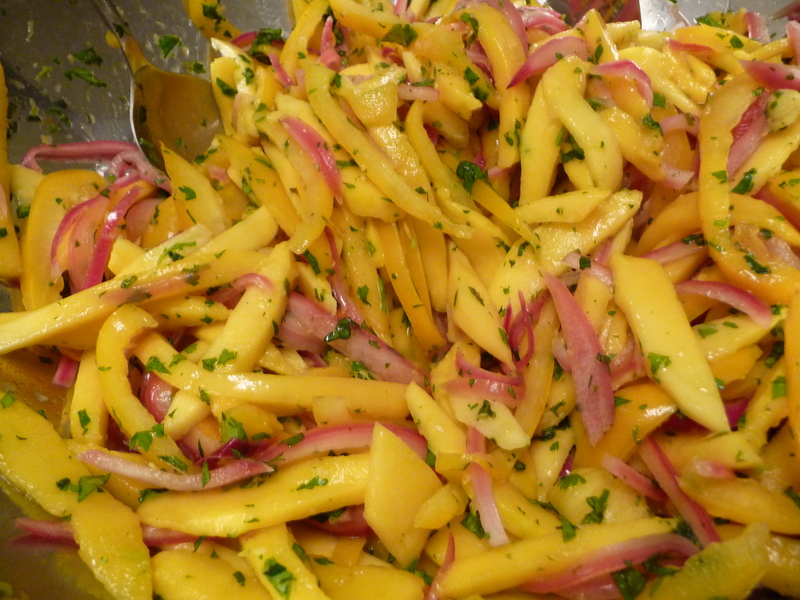 Using fresh ingredients and our favorite herbs and flavors, we created an amazing mango salad that needed no dressing at all. I quickly pickled a red onion based on this recipe that I’ve made before. But to be honest, I didn’t even measure any of the ingredients or look at the recipe and proportions. We didn’t have enough rice wine vinegar so I used what we did have then topped it up with white balsamic, which I brought to a boil with some sugar, salt and pepper. I omitted the mustard seed and bay leaf because we didn’t have those either but no big deal, the onions still came out great. Once the vinegar came to a boil, I removed it from the heat and tossed in one whole red onion, sliced thinly. I let the onion sit in the vinegar cooling and pickling for about 45 minutes and then strained the pretty hot-pink slices and threw them right into the salad bowl. 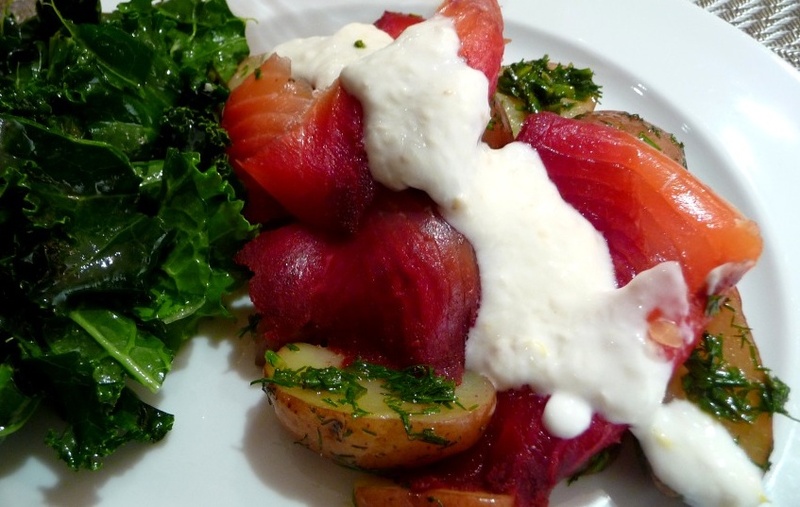 It’s worth the effort because in this salad, the flavor from the pickled onions replaces the need for dressing. I think pickled onions are my new favorite ingredient. I can’t seem to stop making them and adding them to everything. My sister came up with the idea to add grated ginger and lime zest, which brought so many layers of flavor to this colorful salad. She also chopped up the mint and cilantro extremely finely, which helped distribute the herbs evenly throughout, making sure every bite had a nice mix of each. Add the grated zest and juice of 1 lime into the bowl and mix it all together. 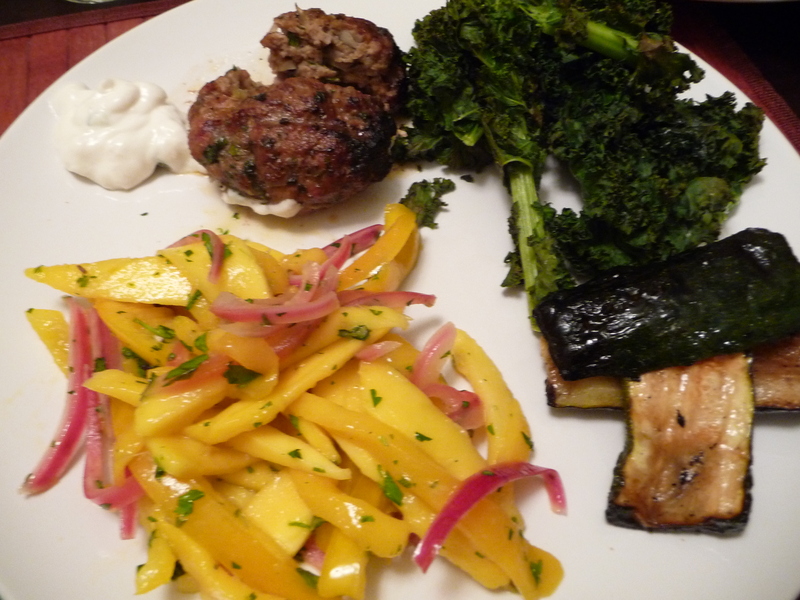 We served this refreshing salad with bun-less homemade lamb burgers and oven-roasted kale ‘chips’ which you can make in a flash for one of the healthiest and tastiest side dishes ever. 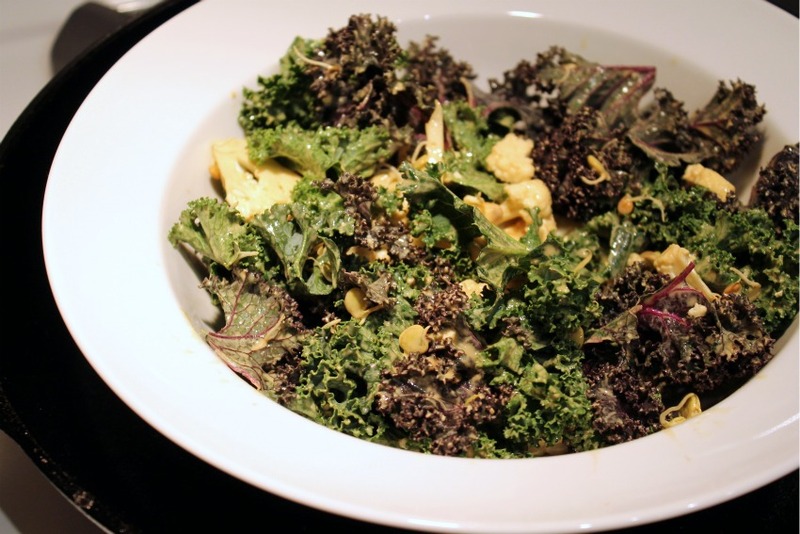 I always feel so good after eating kale and this is a great way to get a good dose of the healthy green. 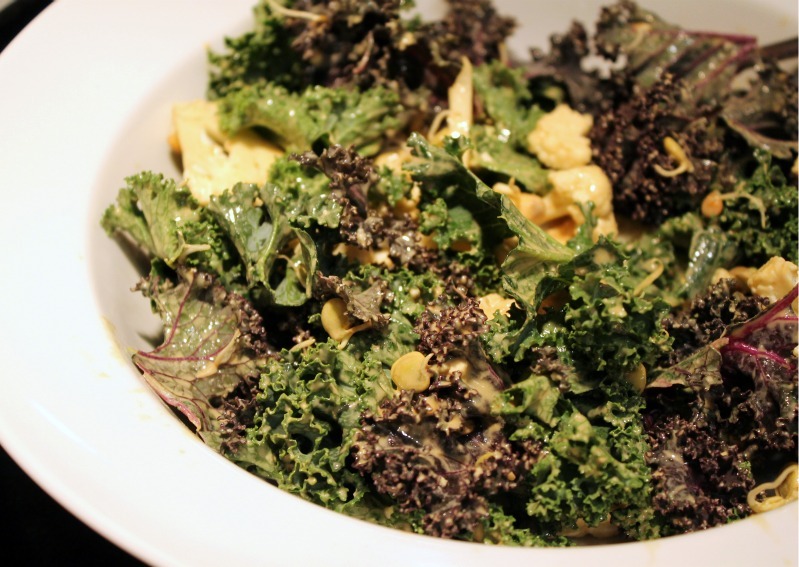 Throw a bunch of cleaned and dried kale onto a baking sheet, brush with a bit of olive oil and sprinkle with sea salt. Then toss into a 400-degree oven for about 5-8 minutes, until crispy. 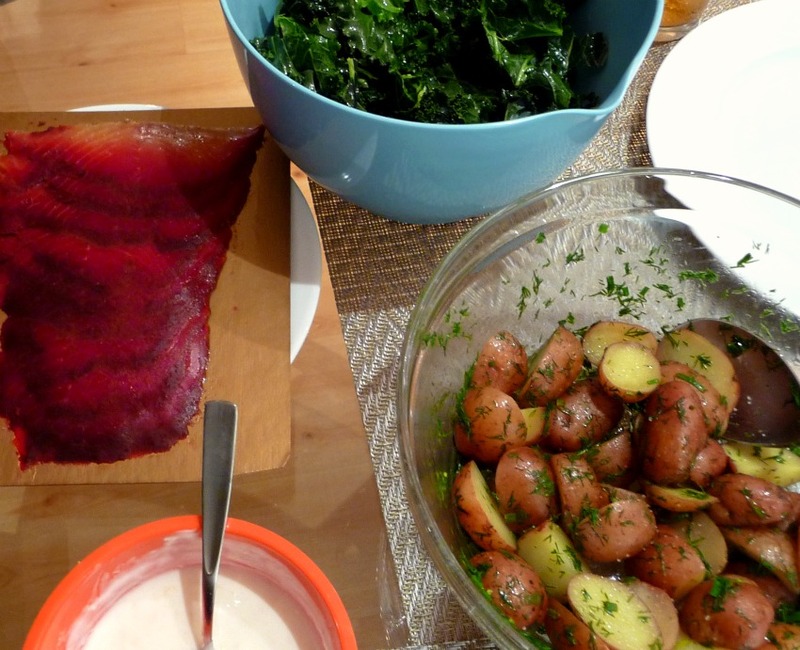 Don’t overcook the kale though, because the ‘crispier’ it gets, the more of a mess it is to eat. You just want the flowery edges to be nice and crispy and the stems to be soft and tender. I’m always trying to get Neil to appreciate tofu, one of my favorites. Whenever I make it he tells himself that he’s not going to love it, that it won’t be satisfying and that he’s really just eating it for me. But somehow, at the end of every tofu meal, he admits to liking it. Tonight I was craving something really healthy, leafy and low in fat and salt, and this is what transpired. It was delicious! I’ve never roasted tofu before and it came out so moist and had such a great texture and flavor. Try it. You’ll like it. Neil might have even said that he really liked it. Preheat oven to 375 C. In a baking dish, drizzle the cubes of tofu and squash with olive oil and grind some fresh pepper overtop. Roast in the oven for approx 40-45 minutes, mixing and turning pieces over half way through. 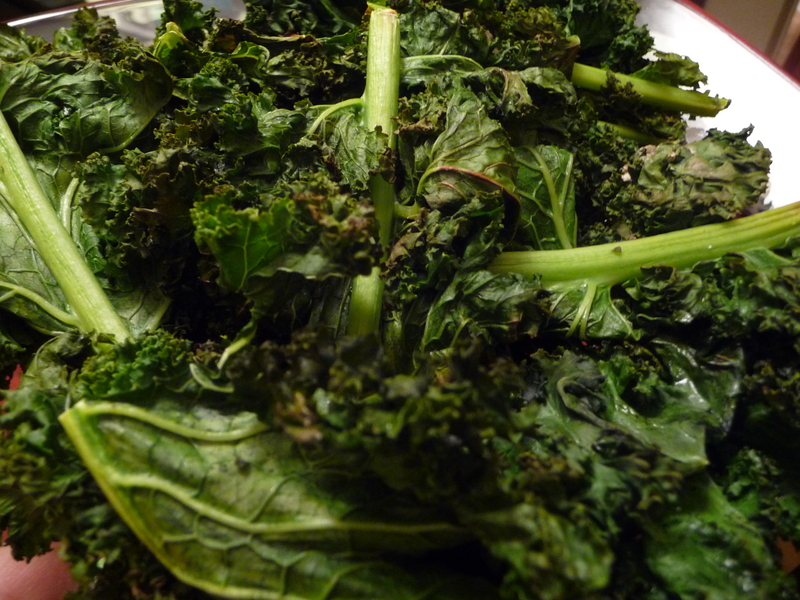 Rinse the kale to get rid of dirt (you really have to clean every leaf if you want to get rid of the sandy bits). Chop ginger into small pieces. Drizzle a bit of olive oil into a large pan on medium-high heat, add ginger and sauté for a few minutes. Add the kale and squeeze in the juice of half a lime. Cover. The kale should steam pretty quickly within a few minutes. Watch it to make sure it doesn’t wilt too much or turn brown. You want to keep that bright green color! A few minutes before serving, add in the grape tomatoes to heat through. I made a quick sauce by mixing the above ingredients (I don’t measure! 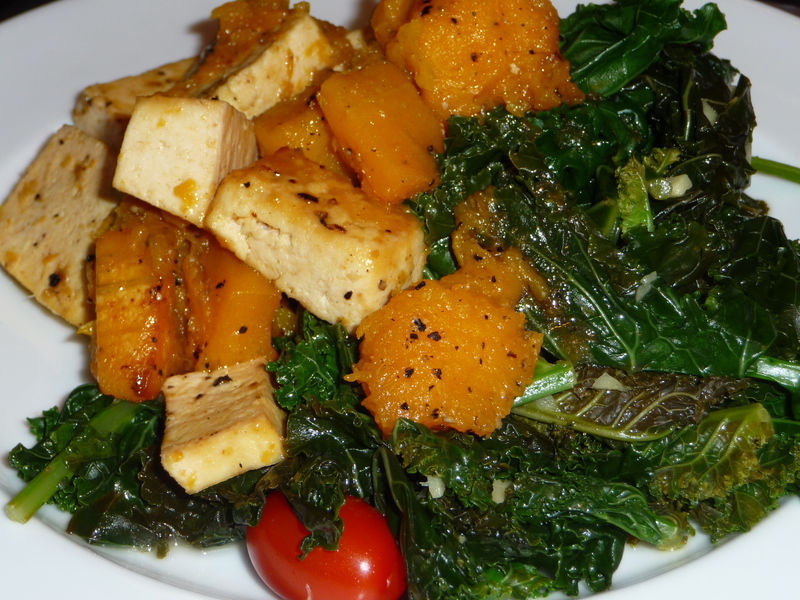 Use your judgment) and I poured it overtop of the tofu and squash when it came out of the oven. This was really easy and quick to make and satisfied my craving for something healthy while still keeping a wannabe ‘meat-a-tarian’ and lover of bacon happy and satisfied. Mission accomplished.